Thảo luận trong 'ENGLISH' bắt đầu bởi Olaf von Voss, 11/8/18. LUTs are mainstream by now. Every halfway decent camera is capable of recording flat log profiles and therefore you have to employ a certain LUT workflow for your shooting / grading / monitoring. If that camera of yours happen to be a VariCam or EVA1, you’re in luck since Panasonic just has introduced their take on a LUT library, free of charge. All in all there are 35 Looks to choose from and Panasonic differentiates between technical LUTs (Log -> Rec.709 for example) and creative LUTs (“warm sun”). The whole LUT library can be used free of charge so you can download these LUTs and use them in your daily workflow as you please. The LUT library is tailored for the Panasonic VariCam line of cameras and the AU-EVA1 exclusively. So your precious GH5(s) with activated V-Log recording is not supported at this time, unfortunately. The total amount of 36 looks are made available in three different variants: Download them as .vlt files for applying a look in-camera, as E-E.cube files for post color grading or as E-L.cube files for using them with “LUT boxes” and other monitoring devices. I think that some of the looks in this LUT library are a little too much, but, and that’s probably the main purpose of this library, it’s nice to see a result very quickly instead of explaining a creative vision from a flat-looking LOG image on the screen. If I would ever use the provided green-tinted Matrix look? Probably not but maybe it could be starting point for something less, well, green. Since these LUTs are totally free of charge, I’d give it a try for sure! To convince a director of a certain look, it is much easier to take a LUT as a starting point and go from there. And even if you’re not seeking a specific creative look, a simple LOG -> Rec.709 conversion helps to soothe a clients nerves on set, rather than dull-looking LOG footage. By creating this LUT library, Panasonic catches up wih ARRI, whose Look Library sports 87 different looks. But, in contrary to Panasonics free library, the ARRI looks require a license which might be included in your camera already –depending on the model and date of purchase– or can be purchased for 280€ (about $320). So there you have it, a free LUT library for your Panasonic VariCam or EVA1, complete with all kinds of different file formats for different applications. Pretty impressive to get this free of charge! Even if some looks might be a little over the top (at least for me), they certainly can act as starting point for further tweaking in post. If you want to use these LUTs as a starting point, I can recommend LUTCalc to tweak them further. It’s a very handy tool which runs in the browser. Head over to cameramanben.github.io/LUTCalc in order to get started. Another tool of choice is DaVinci Resolve, obviously. It’s free of charge unless you want to use the advanced features of the Studio version, which is $299. What do you think? Are these LUTs worth a closer look? What look are you after in your daily work? Let us know in the comments below! 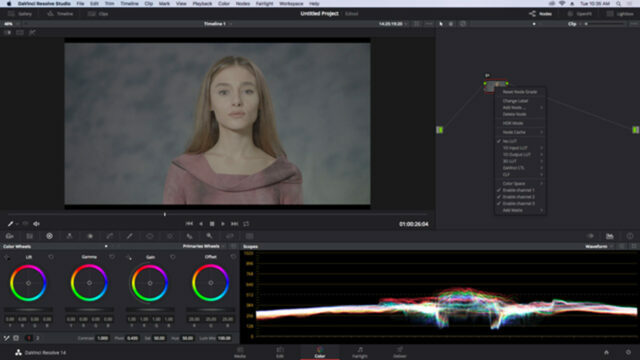 The post Panasonic Introduces Free LUT Library for VariCams and EVA1 Cine Cameras appeared first on cinema5D.